The old chemical plant logo was used during one of the past Mayor Johnny Isbell terms. The current city website webmaster probably has a bmp or gif file of it. The city still has souvenir desk flags, etc. that may also be available. Contact City Hall through the Mayor's Action Line (713-475-555) and ask for Wayne Holt, Publications Manager (wholt@ci.pasadena.tx.us). By the way, the logo can be changed at the discretion of the Mayor, hence, the change when John Manlove took office 7 years ago. The Old Pasadena Dog Pound Site on Hwy 225 before you get to Beltway 8, still has an Original Refinery Logo on it and is also sporting the old sage green paint that once was a signature city color. and there's a sign reading " ROSS COMING SOON"
which, of course will move into the west side of the mervyns. Thanks for the update - are the damages being repaired/covered? 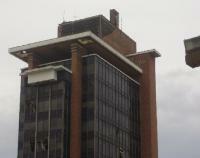 The top of the tower had the brick facing peeled away from the concrete block underneath. This building is once again in danger. it was surprising just how much fell. hard to tell in the pics. 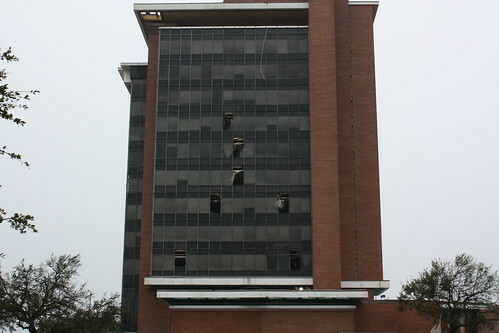 Thanks for the pic, hate to see the damage, looks like the multi-colored glass panels at the top were lost. This poor bldg. just keeps taking abuse. I'm amazed it's still there. I remember it's night-time multi-colored fountain. As a side note, when private pilots in smaller, single engine planes were awaiting clearance to land at Hobby Airport, they would sometimes get instructions from the control tower to "hold" over the Pasadena Bank Bldg. . Here are a few of my photos from 2001. I have been meaning to talk to City Councilmember JJ Isbell, he has spoken to me several time about how the Firm that owns the 1st Pasadena State Bank Building wanted to Restore and reopen. I fear this damage will push him toward tearing her down or he might be able to get hold of some FEMA money, to pay for Demolition. Yes in deed Our Tall Lady of Pasadena is in Danger. Hurricane Ike has put this beautiful structure one giant step closer to a wrecking ball. A Friend on Pasadena City Council informed me that the Bank Tower has changed hands once more. With our current economic worries clouding our minds, saving great architecture opens the door & makes way for another fast food joint. I have voiced at City Council meetings countless times that something needs to be done at the cities level to protect our architectural Past for Our Future, as have many others. A relative told me there are strange flickering lights that resonate through the Pasadena bank bldg. at night, ...a security cop for the mall also witnessed them, who suggested it may be an alarm system malfunction, since the electricity is supposedly turned off. Hope it doesn't catch fire, sounds like it's in danger. That bldg. has some beautiful design work. I couldnt help but notice the numerous broken panes throughout. This is such an iconic building that must be saved! I would pay for a tour of the inside! Serious! Just thought you guys would like knowing what's going on with that old building at Southmore and Pasadena Blvd. Believe it or not, a developer thinks it has a future. The Pasadena Citizen Newspaper featured a headline article on C. David Pomeroy, (Sunday, Jan. 11, 2009). It says that he is planning another local history book, a pictoral, & wants to hear from residents who have photos & oral histories to share. The article shows a picture of the Woolworths on Shaw St. Nice photo, looks like it's from the 40's. "Pittsburgh Paints" is seen in it, as well. I've got my hands full with acquisitions elsewhere so the secret no longer matters, but back in 2005 I was a partner in a group that tried to buy this building for conversion to tax credit seniors housing (something that Pasadena can easily support a whole lot more of) along with a new strip center on the east side of the property. I'd actually cut a deal among the partners to put my grandparents in the penthouse suite for the remainder of their natural lives if we were successful, pretty much at the expense of nearly all my returns on the project. We were willing and very easily able to pay far more than KT bought it for, but I suppose that their deal must've already been under contract when we tried to contact the broker. The broker only spoke to us once, scheduled a meeting that he didn't show up to, and then did not return probably a half dozen follow-up calls. We then tried to call the owner; they also would not return our calls. It sold soon thereafter. Unfortunate. It'd already have been up and running and would've been immensely profitable for me, my group, and the former owner. FWIW, I wish KT the best of luck. They probably won't be able to get anything off the ground in the next year or so just given the financial situation. That's just a stark and unpleasant reality. But I hope that they take care of the building in the interim. I'm confident that it has a promising future. Unfortunately, the paper didn't run any images. I've got a couple of nice renderings from a booklet about the opening... but I can't figure out how to upload them. Anybody want to help? paper. It brought back many, many fond memories. as he made his way to the podium. A day I'll never forget. If you have a digital image, you can upload it here as an attachment (there should be a browse/upload tool in the lower right hand corner of the reply window) or you can host it somewhere and use the "insert image" function ( ) and put the image url in the box that pops up. Tinypic.com is a good place to host pictures for free. I worked in the bldg about 6 years ago. We had the penthouse suite and it was great. Our big boss had the giant corner office and rigged up his door so that he could push a button under his desk and the door would close so he could light up his cigar. It was of course against company policy to smoke at your desk, but who was going to be brave enough to tell him. We also had the only balcony in the bldg being on the 12th floor. I thought about eating lunch out there once. Walked out and it was way too windy to sit down at the picnic table (that we hauled up the wood and built). There was a little space in the basement for a deli and I always felt sorry for the people who tried to open up an eating establishment there. They'd always close in about 1 month after opening because they had no customers. We had about a dozen 5 gallon buckets up there because every time it rained, the roof would leak in about a dozen places. In addition, the toilets were always breaking every other week. The a/c wouldn't work good in the summer and the heating wouldn't work good in the winter. Basically, the place was miserable and we couldn't get the owner to spend any money on maintenance so we left after our lease was up. I don't think anyone moved into the space after we left. Actually there is a 2nd balcony . The other balcony is on the 13th floor, it wraps around the front . You can see down directly onto the balcony with the picnic table . The only access is through the maintenance area . It was really windy up there . Can I share your pictures of the bank, Secretsquirrel? Good pics, but this one is sad, some mod lover would love those chairs. What a shame. See the other pics, there are some good ones of old hotels, too. It's already 2012 and they aren't doing nothing to that building. my Vote is for City Hall to move in and Save Our Tall Lady of Pasadena. I passed by it recently. It's deteriorating, very sad. ^Agreed - I was there a few weeks ago. Sad. The old Memorial Hospital has a fence and sign that says "New Retail coming soon" across the st. Maybe a sign of progress? An Annas linens is opening next to Office Depot. That hospital has been closed/ fenced for quite a while. I noticed that the smaller Pasadena Hospital has changed quite a bit. Is it closed, as well? I can't remember. I just drove by there. Professional bldg. was boarded up. Tatar St.? No, The main hospital a fence was put up and a dumpster was added. I think they will demolish it. The city owned the place behind whataburger and the one behind cvs is still open. What will happen to all those bricks, other materials? What a waste. Well, the building's fate is almost sealed. A small section of the lobby has collapsed. The damage is minor, though. Back in danger of demolition again. The contractors have come to do the asbestos removal. The site is re-fenced, portacans and job trailers in place. Demolition next? A post from a Pasadena Facebook Citizen. " Pasadena Economic Development Corporation purchased a former bank building on the corner of Pasadena Blvd. at Southmore Blvd. and plans to demolish the building and sell the 4.8-acre site. 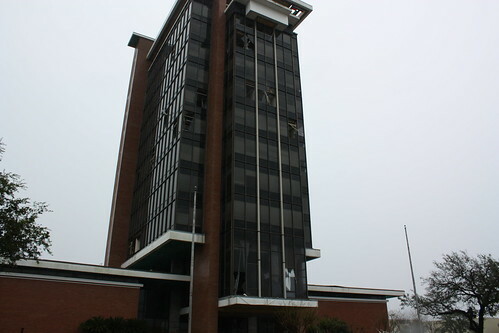 The 12-story building was built in 1962. It will take approximately four months for the remediation and the demolition." The Tall Lady of Pasadena " Texas has been declared an eyesore and is slated for demolition, after the Asbestos has been removed. I am going to Miss her. Four month timeline for abatement and demolition - wow. This is really one of the more interesting towers in all of the Houston metro. The architect was a student of Frank Lloyd Wright. Just posted earlier that this building has been bought and slated to be demolished and land sold per Bay Area Houston Economic Partnership newsletter.